English filmmaker Terence Davies is not terribly prolific, but, rather like American namesake Terence Malik, has compensated with a unique style and thoughtful maturity that rewards the viewer for any overly long intervals between features. 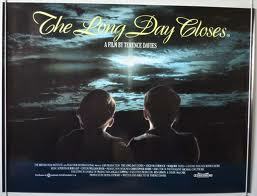 THE LONG DAY CLOSES (1992), a heavily autobiographical story of a sensitive boy growing up in Liverpool not long after WWII, is my favorite of what I've seen of his work, and like his breakthrough DISTANT VOICES, STILL LIVES - an art-house darling in its day - has very little of a strong forward-motion narrative; it was mainly about moods and emotion. THE LONG DAY CLOSES, a sort-of sequel, is even more refined, verging on very nearly plotless. Yet I dug it. The hero, Davies' alter ego, is an introspective, slightly gawky (in a Crispin Gloverish way) 11-year-old Liverpuddlian named Buddy (Leigh McCormack), who rarely speaks. In these enlightened days they'd diagnose him with autism/Asperger's and pump so many drugs into him that he'd become an addict trying to eat his mum's face, and his family would be in debt to the medical establishment forever and no later film career, nosiree... Fortunately for Buddy/Davies he's living instead in darkest 1950s England, a far less sophisticated era. There are bare cupboards, severe rationing and postwar economic deprivation (don't worry, those days of austerity look to be coming back). Relief, for Buddy, anyway, comes in the form of a low-intensity media barrage, of bits of pop songs (Nat King Cole, Debbie Reynolds), radio broadcasts, hymns, music-hall entertainers, an idyllic family closeness, church, and, of course, cinema. Buddy starts attending a chilly-looking Catholic school - and brings home a bad case of head lice as a result - but can still find refuge in the imagery and sensations offered at the neighborhood movie palace, among other diversions. The non-storyline is a reverie-like procession of imagery, very nicely capturing the way things seem remembered through a childhood POV of amber-colored nostalgia more so than the truth. Over the visuals - one is nothing more than sunlight slowly creeping across the texture of a well-worn family carpet - is lain an exquisite sound design. Talk among the characters is only muffled chatter; what stands out clearly are the melodies and snatches of movie-dialogue excerpts, from GREAT EXPECTATIONS, THE MAGNIFICENT AMBERSONS, THE LADYKILLERS, or whatever else is playing at the local odeon (or in Buddy's head) as a sort of interior mixtape. Actually the movie takes place as much in church as in the movie theaters, and it doesn't take much imagination to guess that Davies views them as much the same thing (wonder if Scientology ever scouted him out? ).